This software enables you to fast download, edit and convert YouTube video to MP3 at one go! Are you suffering from the trouble of converting YouTube Music Video (MV) to MP3? Have no clue of extracting audio from YouTube music video for playing on MP3 players, iTunes, iPhone and so on? The average free YouTube video downloaders can only download YouTube videos directly and output them in the video formats like MP4, WebM (VPB code), FLV and 3GP. And you also need to convert the downloaded YouTube music video to MP3. What if there is a software program that can both download and convert YouTube videos? WinX HD Video Converter Deluxe is such software that can meet all your needs of YouTube video downloading, popular video editing, and video to audio conversion including free converting YouTube music video to MP3. WinX HD Video Converter Deluxe software can convert between different video (audio) formats, running on Windows PC (it also has Mac version). It has 320 video codecs, 50 audio codecs and 410+ preset profiles. After the video conversion, you can play (YouTube) videos on iPhone 6/Plus, iPad Air 2, iPad mini 3, iPod, HTC One, HTC Desire, Samsung Galaxy S6, Galaxy Note, Galaxy Tab, WP8, PSP and so on. It supports almost all HD and SD video formats you are commonly using, including MKV, M2TS, MTS, AVCHD, AVI, MPEG4, WMV, MOV, etc. Moreover, this HD video conversion software can extract music from videos, namely, convert videos to audio files, and save them in MP3, AAC, iPhone Rongtone, AC3, WMA, AIFF, CAF, DTS, OGG, AU, RA, WAV, FLAC and ALAC. It is also built-in with YouTube downloader and video editing features such that it can realize downloading and editing YouTube videos, as well as converting YouTube music video to MP3, YouTube to AAC, AC3, WMA, etc. WinX HD Video Converter Deluxe is a great helper to convert a YouTube MTV and save it as a MP3 audio. Please just free download WinX HD Video Converter Deluxe and then install it the same way with other software. Step 1: Run the software on your PC (or Mac with Mac version), find your favorite music video on YouTube, and directly click/copy "YouTube URL". If you have YouTube Videos on your hard drive, you can just click "+Video" button to import the video. And then the built-in free YouTube video downloader will auto recognize the YouTube video link and "analyze" the YouTube music video. Please choose and check the options listed in different video formats, resolutions, sizes and codes. Step 2: Tick button "Auto convert" to move into output format selecting sectoin. Click "To Music" button under the Output Profile Category, and select "MP3" as the output format. MP3 is recommended as a music format widely used in iTunes, iPhone and the majority of music players. FYI, if you are not in need of extracting YouTube music video to MP3, you can choose to do a fast download only of videos from YouTube. 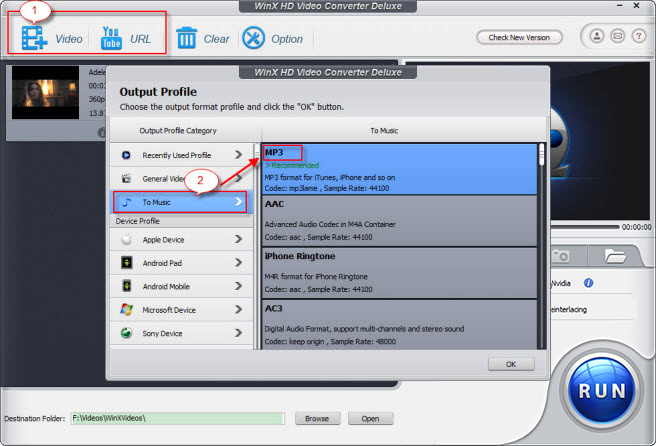 Step 3: If you do not need to edit video or change the destination folder, just click "Run" button so that WinX HD Video Converter Deluxe can begin to convert YouTube music video to MP3. When it is done, you can find the MP3 file on your computer. How to Get Free YouTube to MP3 Audio Converter? Spotify to MP3: How to Free Download/Convert Spotify to MP3 for Offline Listening?